The University of North Carolina at Greensboro is one of the seventeen campuses of The University of North Carolina, the birthplace of public higher education in America. Administered by President Margaret Spellings and overseen by The UNC Board of Governors, each campus is headed by its own chancellor and Board of Trustees. The Board of Governors of the 17-campus University of North Carolina elected Franklin D. Gilliam, Jr. Chancellor of The University of North Carolina at Greensboro (UNCG) on May 22, 2015. Gilliam assumed his duties as Chancellor on September 8. Frank Gilliam has distinguished himself as a faculty member, researcher and top-notch administrator during his career that spans three decades. He has taught and held senior leadership positions at the University of California at Los Angeles (UCLA), one of our nation's best-known and most-respected public universities. At each step throughout his career Gilliam has proven to be an engaged leader who promotes openness and collaboration, strategic thinking and creative problem solving, and demonstrates a strong commitment to academic excellence and community partnership. 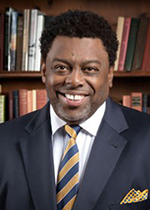 Dr. Gilliam was appointed Dean of the UCLA Luskin School of Public Affairs in September 2008, and was a longtime UCLA Professor of Public Policy and Political Science. His research focused on strategic communications, public policy, electoral politics, and racial and ethnic politics.